The start of the rose flowering period in my garden even today loading these photos the garden has changed since I took the photos two days ago. Crocus Rose a delightful rose with soft apricot buds opening and bleaching to mainly white flowers. with a delicious fragrance. Falstaff strong bold flowers and deep rose perfume but after rain a tendency for the heavy flowers to droop. Sweet Juliet a beautiful flower strong plant and abundance of flowers although the flowers are looking smaller this year than I remember. 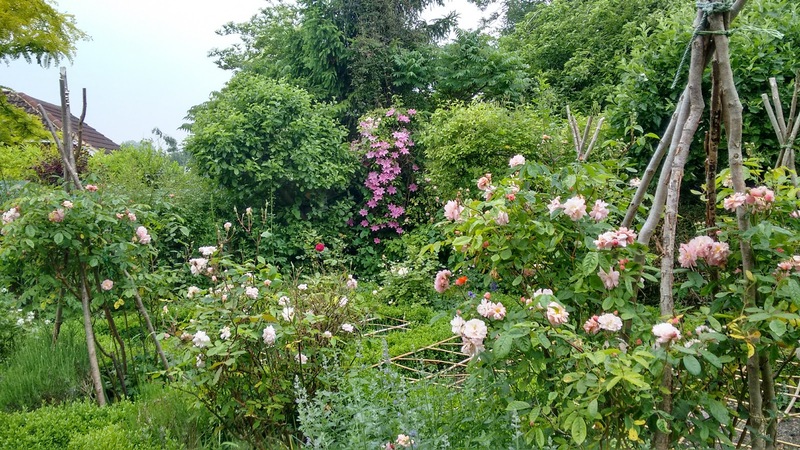 Mayor of Casterbridge another vigorous shrub rose hence the supporting hazel poles. A strong fragrance. Mayor of Casterbridge again the flowers seem much smaller must remember to feed with compost this year. Francis E Lester difficult to photograph as most of the flowers seem to be in next doors tree. Rambling Rector always an early flower and very rampant it really deserves a much larger area to climb. Cottage Rose one of my favourites and one I have taken cuttings from. Cottage Rose was moved three times before liking it's current situation and thriving. Cecile Brunner grown from a cutting given to me by a dear neighbour who is no longer with us. Francine Austin I have grown several cuttings from this plant. England's Rose bought for my Dad when he was living with us some years ago, this year it is blooming very well since redoing this bed. A tour to look at my early clematis, I hope you enjoy them. Not a great photo but it gives the setting these two clematis are growing in. Nelly Moser grown from a cutting thankfully as the original died after replanting a shrub nearby. 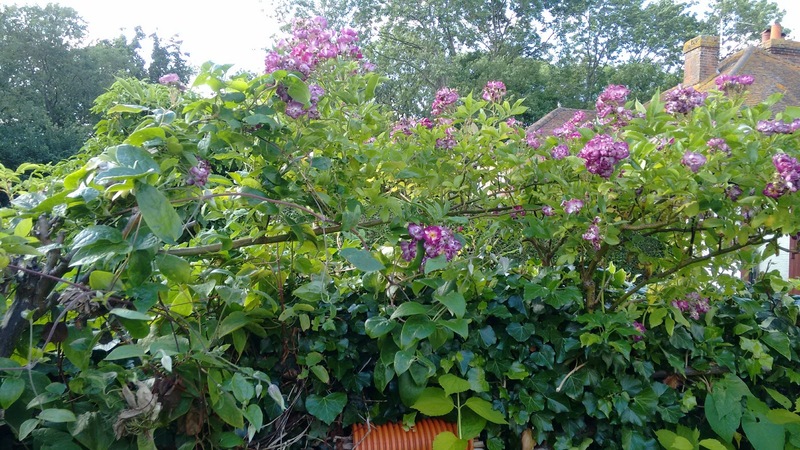 Not the best photo but a clematis I treasure, the original died and this cutting taken many years ago survived but has been accidentally chopped back on more than one occasion, when pruning the rose Rambling Rector which it grows through. Marmori with a promise of so very many buds. Sunset in a shady corner but managing to hold her own despite being nibbled. Macropetala from several weeks ago another grown from a cutting of a cutting and the original plants died. The sign was discarded as rubbish where my husband worked so acquired legitimately. A last glimpse of Pink Fantasy in its garden setting. Veilchenblau, what a glorious rose. Sadly either last summer or over winter this beautiful rose tree died. It is not completely lost because a cutting is growing profusely in my daughter's garden. Most photos on my blog hove in on the beauty of whatever is flowering so you rarely see the nitty gritty of the masses of ground elder that strew so many of my beds. Every year I tackle various areas by weeding out the spaghetti roots of ground elder and I give up on the bindweed, which I was advised by a reputable gardener, could really only be removed by a JCB due to their long root run. 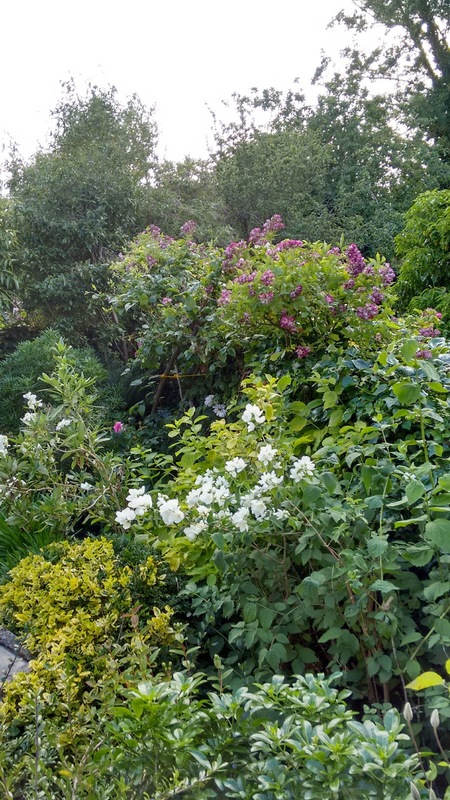 A couple of years ago in recognition of my arthritis caused by Lyme Disease and my age I decided to give up even trying to weed the area behind the greenhouses, of ground elder. I covered it in synthetic weed suppressant and large bark chippings except for one or two trees and shrubs. It has worked very well and serves as an extra place to put the rather large number of plants I have taken from cuttings and not as yet found homes for. The above photo gives an idea but it is only part of that bed. Today I decide before I planted my replacement for Veilchenblau then I needed to make some effort to clear at least the back of the bed and so with my earlier success I decided to weed out as much ground elder as was convenient and cover in weed suppressant and small bark chippings. I need more chippings to finish behind the seat. I needed a new home for this lovely acer which was getting too large for it's usual position, so this a trial to see if it works behind the seat. So far I have only dealt with about half the border, so I have much more to do. You get the idea of the problem from this photo. Centre back are several clematis which will need careful managing. The peony is about to burst into flower so I won't be disturbing that just now. The small shrubs back right will also take some managing to suppress weeds at their base. Most years I stand my Agapanthus at the front of this border mainly because I run out of space elsewhere, but it does help to dress the border this year. Some small shrubs were dug out cleaned and replanted and I also planted a new rose rather to the left of the old one so I am hoping it is far enough away to thrive. My new rose is Albrighton Rambler thank you David Austin. Planted a little behind the Choisya ternata White Dazzler.